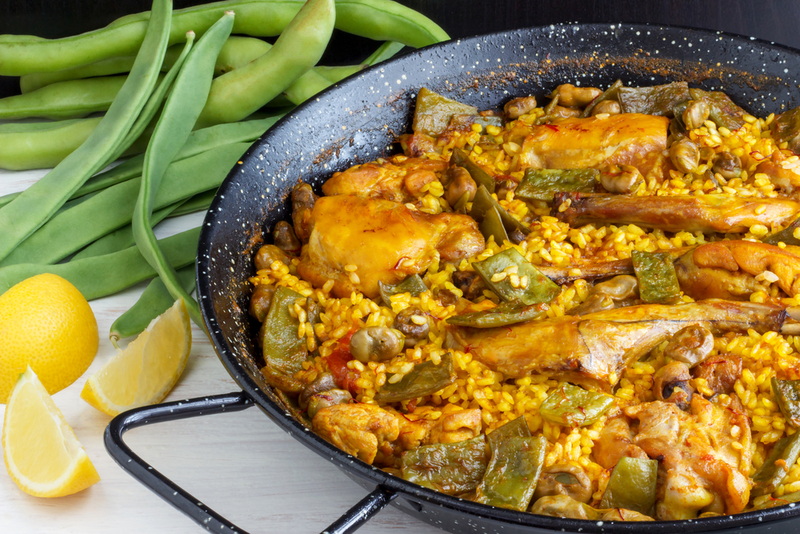 There can be no greater symbol of Valencian gastronomy than paella. Indeed, the phrase “Andar de paella,” or “to go for a paella” is heard frequently at every type of social occasion throughout the region. And why not? – Saint’s days, birthdays, weddings, every occasion justifies bringing out the famously oversized rice pan that gives the local dish its name. This passion for paella reaches its apogee during the Fallas festival in March, when gigantic pans are seen all over Valencia, cooking a multitude of different types of the dish over open fires. Truly, it is an awesome sight to behold. 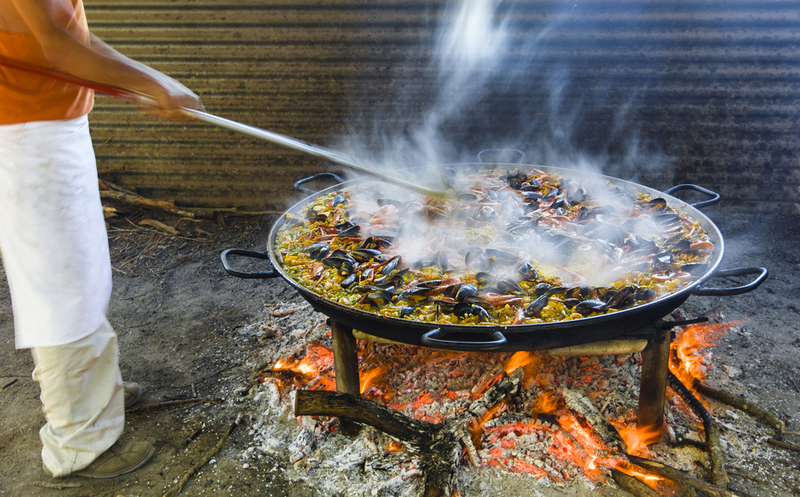 Yet paella has humble origins; the Valencian’s national dish was born in rural areas, coined by agricultural workers who started fires in the fields to cook rice in a flat pan. Additional ingredients were added as they became available; snails, vegetables, seafood, rabbit, blood sausage and liver are all found in paella today. But, any purist would tell you that the ingredients are a secondary consideration to the method of preparation – professionals always cook over burning hot wood fires, reducing the heat continually during cooking. In addition, the correct amount of oil is another decisive factor; the paella should never be too greasy. And finally, a true aficionado will only use the exact amount of local water – never water from other regions in Spain! At its best, paella is the King of Spanish cuisine – served piping hot, the intense aromas of the dish and flavors are incredibly rich and moreish. The undisputed star at special occasions in Valencia, this paella is a heady mix of white beans, rabbit, chicken, rice, garlic and, of course, saffron powder. The flavors are naturally intense and varied, requiring a robust pairing to bring out the best of both the food and wine. However, rabbit often dominates, suggesting a lively, young Tempranillo-based red is in order, with plenty of acidity. Several Rioja’s would do the trick, but our favorite pairing is Roda’s excellent cuvee Sela. A relatively new addition to the portfolio, Sela is a medium bodied, softly scented delight, the ideal foil for paella where the meat flavors dominate. However, other Spanish regions also offer plenty of enticing options, if you’d like to give Rioja the night off. Penedes is a good place to start – Albet I Noya is a leading producer of organic wines in the region, including a range of excellent sparkling wines, and blend of Tempranillo, Cabernet Sauvignon, and Grenache, called Petit Albet Negre. Benefiting – in this case – from a lack of oak aging, this juicy, vibrant red cuts through the oil of the paella with effortless guile. But if that’s not “off-piste” enough for you, try Vinas del Vero Series Limitadas from the Somontano region of Aragon. The region lies at the foot of the Pyrenees mountains, and actually means “Under the Mountain.” Vinas del Vero is undoubtedly its best producer – their Series limitadas is an unusual blend of Syrah, Tempranillo and Cabernet Sauvignon that works incredibly well with paella Valenciana, matching the richness and cutting through the oil. The ultimate summer dish, paella marinera is a heady concoction of shrimp, langoustines, squid and mussels, a firm favorite across the region in the hotter months. 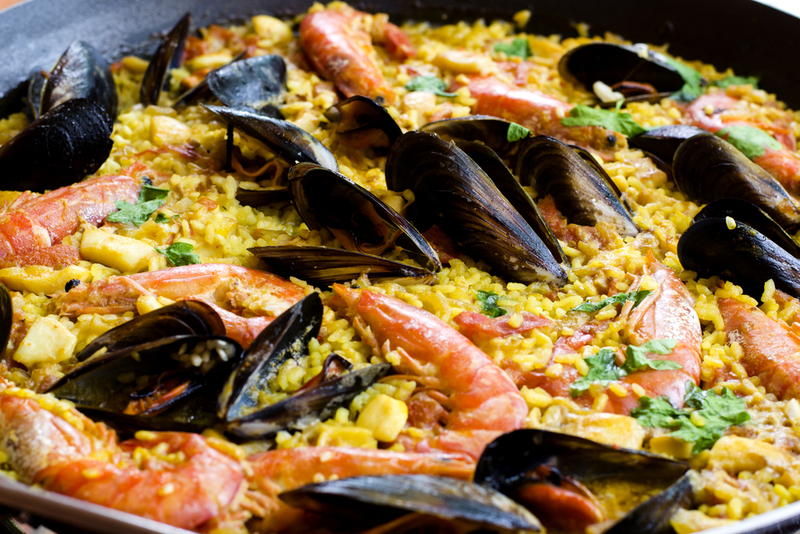 Of course, the obvious pairing is white, as red would smother the more delicate flavors of seafood paella – Spain offers many good options, including Albariño, Verdejo or our favorite, Godello. Racy Albariño, principally grown in the Rias Baixas region of Galicia is the obvious cliche, but it is nonetheless a pairing that works very well. Unoaked whites are always preferable with seafood paella, and Albariño’s clean citrus and stone fruit flavors provide the perfect pairing. Pazo Señorans, Selección de Añada would be top of our list, followed by Valmiñor’s O Rosal. Alternatively, a soft rose is another great match, particularly wines from Navarra, which seems to have an affinity with making a great rose. Bodegas Chivite make an exquisite rose, one of the best in Spain in fact, called Las Fincas Rosado. Gorgeous red fruits dominate the palate, offering a pleasing foil to the seafood aromas of a home-cooked paella marinera. Lastly, why not try Txakolí, the Basque’s Country’s signature white grape variety. Bursting with acidity and freshness, the grape is a traditional match for seafood dishes in the region. Or, when in Catalunya, try a high-quality Cava. Sparkling wine is increasingly being appreciated in Spain as the versatile food matching drink that it is, and not simply a New Year’s Eve standby. Gramona’s Ill Lustros would be perfect. 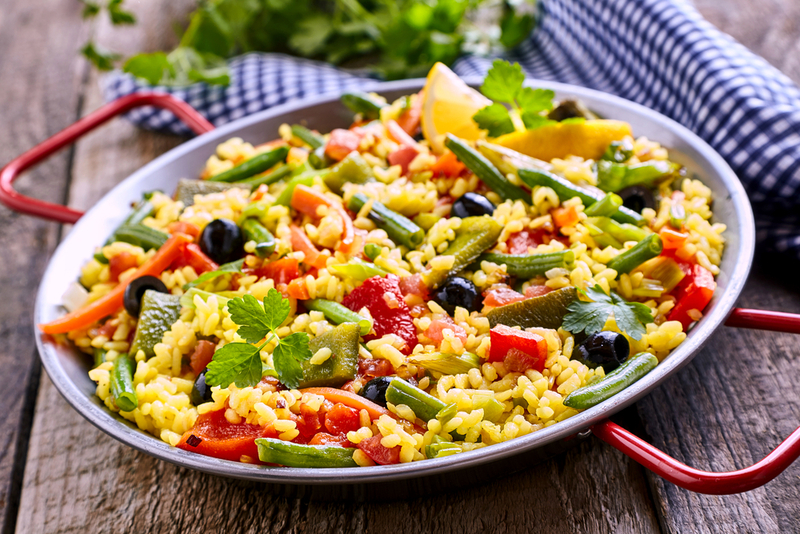 Paella de Verduras manages to be both healthy and astoundingly delicious; artichokes, asparagus, olives, mushrooms, palm hearts, broad beans, butter beans, red pepper, green pepper, onion, tomato, and parsley typically find themselves cooking in the pan. Whites work reasonably well, but sparkling seems to handle the variety of textures and flavors with greater ease, particularly rose. Albet I Noya’s Efect Brut Rosat is one of the finest sparkling roses we’ve tried from Penedes – 100% Pinot Noir, this traditional method fizz is both racy and generous, stuffed full of summer fruits. It’s irresistible enough as it is, without taking into account its food-matching credentials. Raventos I Blanc de Nit is another excellent choice. 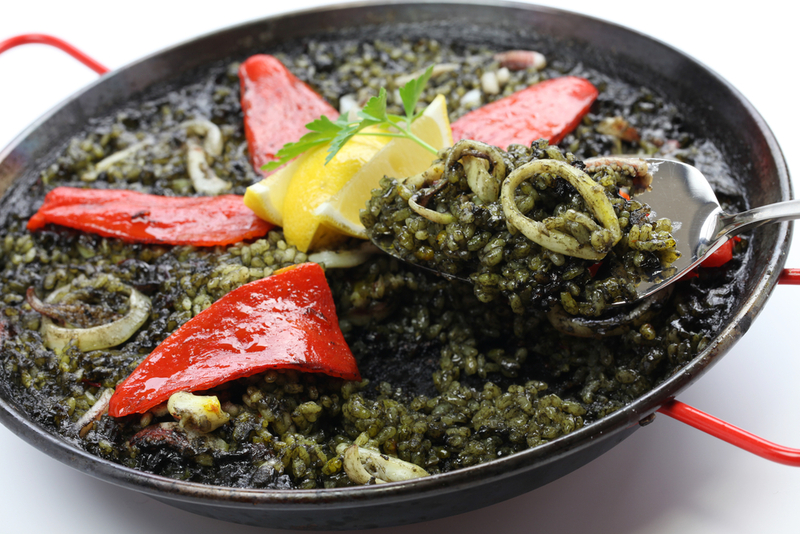 A Catalan standby, paella negra (black paella) is rice colored with squid or octopus ink. Its signature flavor is hardly subtle, and so requires an equally robust paring. Gewürztraminer works very well – Torres‘ Vina Esmeralda is our favorite pairing, the intense aromas of rose petal and lychee offering a nice counterpart to the saline notes of the black ink. Or, be adventurous and try a sparkling Moscatel from the regions of Valencia or Alicante. The sweetness inherent to these wines complements both the delicate texture and slightly sharp taste of this paella wonderfully. It’s the thinking gastronomes ideal choice!